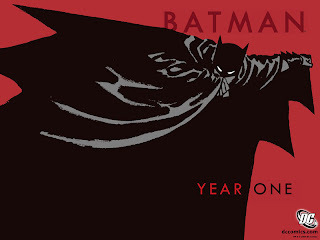 First, there was the Batman: Year One comic book, which has made multiple lists of Greatest Batman graphic novels. You can read a detailed synopsis of the graphic novel here. So then we had Darren Aronofsky on the scene, still hot following Requiem for a Dream, in a collaboration with Frank Miller, creator of the graphic novel. 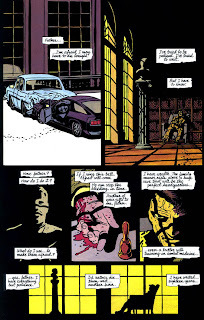 They collaborated once before on an adaptation of Miller’s graphic novel, Ronin, which never got off the ground. Aronofsky was quoted in Entertainment Weekly as saying, “I'd want to bring an independent guerrilla flavor to Batman.” In David Hughes’ book, Tales from Development Hell, Aronofsky later claimed that the film wasn't greenlighted because Warner Brothers found it to be too violent and that an R-rated Batman film wouldn't appeal to children. Then the director came up with the idea of making two separate films, one based on Aronofsky/Miller's Year One that wouldn't require a big budget and the second, a family friendly affair. This was rejected. Like I said Aronofsky seems to make sure DRUGS have a major role in each of his films.The opening lets us into this Herion-Under world smuggling on gothams harbor..A huge warehouse..Were The Penguin (Roman replacement) is made into a drug smuggling Mob boss..That talks bird jive. And yep we get to see some Herion pumping action..As the penguin shows Some of his goons what will happen if they turn on him.He attaches a thug to a table and injects tons of herion into him...dadada sceen plays out way to long..And then BAM! COPS BURST IN..Jim gordon and all..Smack smack.. Machine guns..Car chase..You keep expecting batman to show up but he never does. Bruce wayne Takes an old school Girlfriend (yet he has been gone from gotham for sometime) Out on a night to some Gay disco club.. Then we sit through 30 pages of Bruce Wayne doing this and that.Suddenly relizing he is a BAT!..In this film he is driving with some blonde Bimbo in his Corvette and a bat slams into the windsheild causing an accident.He has some Flash backs (that play more like drug trips) and he looks at the girl after he saves her from the exploding car..He says "I've got a job to do"
Then BAM! We flash onto a sceen where Bruce wayne is dressed in a Black outfit..Fighting some thugs..Then he does the whole they are not afraid of me..I must be a Bat thing and makes an outfit..And converts his Stingray Corvette into a Batmobile. The black Alfred..hmmm..Well When Aronofsky said "Year One will be something Cool and Differnt" Is this what he meant?..A jive talken brotha..Well I'm no racest..But SPAWN is BLACK and ALFRED is WHITE! Batman walks out in the outfit and asks alfred "How do I look?" Alfred " Slammen!" I did not read this script. I don’t know what he’s talking about. But this may have been a first draft, because Gordon cheating on his wife was in the Frank Miller graphic novel. Plus, Aronofsky had no desire at all to be faithful to the source. So, there may be truth to their review. Thus, I’m only going to review the final version of the Aronofsky / Miller collaboration, which is similar to the one that’s available online. This just made me appreciate David S. Goyer and the Nolan brothers that much more. The pages of The Dark Knight, which I wrote about, just flew by. But reading this script was a tedious, laborious undertaking. This felt like a newbie script on TriggerStreet. After the death of his parents, young Bruce Wayne remains lost on the street and is eventually taken in by Big Al, owner of an auto repair shop with his son Little Al. Driven by a desire for vengeance towards a manifest destiny of which he is only dimly aware, young Bruce toils day and night in the shop, watching the comings and goings of hookers, pimps, and corrupt police officers across the street to a cathouse. We are then introduced to detective James Gordon as he struggles with the corruption he finds endemic among Gotham City police officers of all ranks. 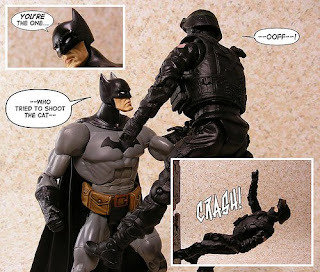 Bruce's first act as a vigilante is to confront a dirty cop named Campbell as he accosts "mistress Selina" in the cathouse, but Campbell ends up dead and Bruce narrowly escapes being blamed. Realizing that he needs to operate with more methodology, he initially dons a cape and hockey mask. However, Bruce soon evolves a more stylized "costume" with both form and function, acquires a variety of makeshift gadgets and weapons, and reconfigures a black Lincoln Continental into a makeshift "bat-mobile." In his new disguise as "The Bat-Man," Bruce Wayne wages war on criminals from street level to the highest echelons, working his way up to Police Commissioner Loeb and Mayor Noone, even as the executors of the Wayne estate search for their missing heir. In the end, Bruce accepts his dual destiny as heir to the Wayne fortune and the city's savior, and Gordon comes to accept that, while he may not agree with "The Bat-Man"'s methods, he can't argue with the results. The first element that drove me crazy throughout this script was the corny exaggeration in the action lines. It is the sound of INCOMPREHENSIBLE HORROR. One of the assailants becomes impatient and SHOVES BRUCE. There is no delay in cause and effect. The shove sparks an almost ORGASMIC release of RAW, PENT UP VIOLENCE from BRUCE. HE EXPLODES - CRACK! CRACK! CRACK! CRACK! First, the capped words are annoying, which we talked about in great detail in the comments of the Dark Knight post. Second, the extreme exaggeration in the descriptions of the actions makes the two scenes feel as if the writer’s overselling the moment when it probably won’t come across to an audience the way that it’s written in the script. I’ve also heard it said repeatedly in the business that comic books are storyboards of movies on paper. I’m in the minority on this, but I’ve never quite bought into this argument for a variety of reasons, the biggest one being the handling of exposition. In comic books, they always explain everything, and I mean everything, including motivation, backstories, and feelings, through dialogue or narration. Motivations and feelings can be easily read by watching an actor act. But since comic books are usually intended for younger audiences, motivations and feelings, sometimes internal dialogue, are carefully written out in dialogue. Subtleties and subtext plays better on film than in comic books. You don’t need to be beaten over the head with motivation that’s already obvious through action. And what makes comic book adaptations so weak, to me at least, is the fact that they frequently break the show, don’t tell principle of screenwriting. All of the words on this page would be totally unnecessary in a script. You gotta show, don’t tell. And this gimmick of having a young Bruce writing letters to his dead father in which he explains all of his inner emotions and desires and questions is weak screenwriting. The TV NEWS plays in the back ground as BRUCE applies a fake scar onto his cheek. will hopefully mask my identity. BRUCE puts on the overcoat and wide-brimmed, concealing hat. Father, tonight I am declaring war! — HIS FATHER'S SIGNET RING. of them kill. The other just HURTS! for tonight. He's the GENERAL! The enemy is everywhere, even HERE. And as if all of those voice overs weren’t bad enough, then we get voice overs from GORDON! Are you kidding me? I'm still surprised nobody has done an adaptation of 'The Killing Joke' or 'Arkham Asylum: Hell on Earth' (I think that's the title, correct me if i'm wrong). well, i suppose you can see similar elements of both novels in "The Dark Knight" because of the Joker, but whatever. Never read the script, but that was pretty brutal to read those little VO. I hate voice over. I tried it once in a script but it only lasted a few pages. Then I got tired of trying to explain without explaining. I still say that dialog, when done well, is show not tell. When you look at film analysis the "telling" events come with the expression of the speech act. The only time dialog shouldn't be an integral part of a scene is when the character is alone. true drama comes from interaction which implies speech - our most thorough form of communication. So often, fighting is depicted as simply raw, kinetic energy. I don't know if there's a better way to show the mental effort that goes into a fight. This bit not only gives us a genuine thought process, it's also funny. You can imagine the punch landing just as he says "hurts!" christian, yeah V.O can be really tricky. You gotta be careful not to use it too much, but once in a while, it's not so bad. I've only used VO ONCE in just ONE script out of all the many scripts I wrote, and for very good reasons. Wow, DBTP, trying to use just one of those words came out very negative. Yeah, the only time I used it was for some character intros and a quick backstory for the protag. It's just very difficult to not be redundant as most VO is. "The only time dialog shouldn't be an integral part of a scene is when the character is alone. true drama comes from interaction which implies speech - our most thorough form of communication." While dialogue may be the most "thorough" form of communication, people communicate in so many subtle and not so subtle ways beyond mere speech. And so to say that true drama comes from interaction which implies speech is an incorrect conclusion. An entire scene can easily be shot between two people without a word of dialogue...and that scene, if handled properly, will often be far more powerful than if they had actually spoken. If you don't believe me watch City Lights...watch how Charlie Chaplin and Virginia Cherrill convey a world of drama through action...not dialogue. After all, the essence of film is image, not sound. At least that's how I see. deaf - You're right in that second comment in that there are great films with voice overs. I wrote about some here. Christian - Of course, Joshua James tells me on occasion that lots of dialogue can work so long as it's great dialogue. I do agree, but V.O. to explain inner feelings? Oy, no thank you. Anon - Hehehe... Okay, I'll give you that one, because I adore you. rhp - I have to agree, and my good friend, Bob Thielke, wrote a completely visual screenplay. Sorry. So often when I read comments, I think, "Hey, I wrote about that!" Thanks, guys, hope you're all doing well. Yes, you are absolutely correct...you caught me! I "borrowed" the City Lights example from one of your posts I believe...it was such a great in-your-face illustration of visual storytelling I couldn't help myself. I love that movie! And your series on "The Art of Visual Storytelling" was my eureka moment or "series" of escalating "moments" really, as I'm a little slow on the uptake...think it took until the next morning in the shower before I digested it completely...before it finally hit me like a freight train...square in the jaw! So, thanks for all of your hard work...for all of the time you spend shaping us newbies into more technically competent screenwriters. It truly is greatly appreciated! Anyone else notice that he took this from Batman: TDKR?